Want better data? Ask the right questions. From radio buttons to Likert scales to allowing respondents to upload files, our massive library of survey question types lets you gather just the data you need. Get the data you need by asking the right questions. 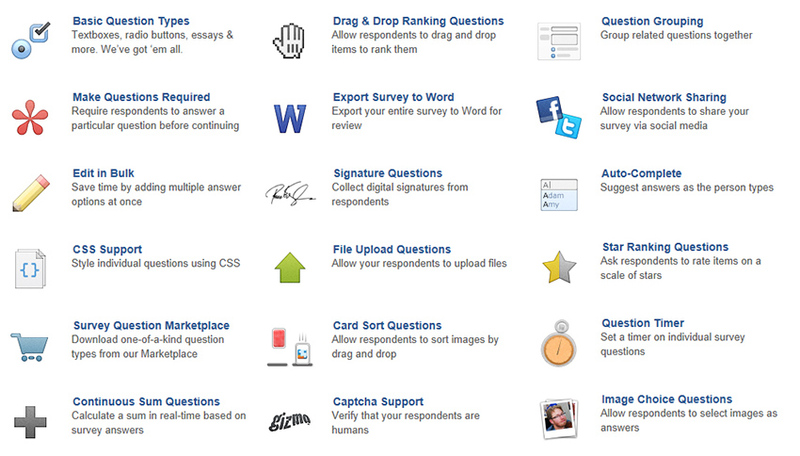 Use Drag & Drop Rank Order Questions and Likert Scales to gather opinions. Calculate a sum in real-time using Continuous Sum questions. Ask respondents to upload files. No matter what data you need, we have the question type to collect it. The Drag and Drop question type can be used to have your respondents rank a list of items of your choosing in a visual, and interactive manner. It also has the ability to switch to a Table Ranking question type to allow ease of use for screen readers. To learn more, please see Table Ranking. Drag and Drop Ranking is best used when you’re looking for a question type that allows a survey taker to visualize their choices and allows them to easily rearrange the items prior to submission. It’s generally used when you’d like to have an opinion on where a particular item ranks in a pre-determined list. This allows your respondents to feel as if they are physically interacting with their survey, and helps them to feel empowered. A Likert Scale allows the respondent to rate a question on a scale of choices such as “1 to X” or “very unhappy” to “very happy.” These choices are shown horizontally by default, with labels above or below each choice, but you can customize them to display vertically as well. Typically, the reporting value is numeric for analysis purposes, but you can leave the reporting value as alphanumeric as well. A likert scale is great for allowing respondents to rate a specific item. If you need to have your respondents give you an opinion on a particular item, the likert scale is a great choice for both it’s visual aesthetic quality, and for it’s ease of use. For example you can ask the respondent how much they agree or disagree with a statement on a scale from strongly disagree to strongly agree. The Radio Button question type is the most common survey question format. It presents the respondent with multiple choices that are mutually exclusive, but allows them to select only ONE of them. Once you’ve selected a radio button option, you cannot unselect it, but you can choose a different answer if you prefer. You would use a radio button question if you needed your respondents to choose a specific option out of pre-defined answers. A great example of a Radio Button question would be, “What is your gender?”. The answers would be “Female”, “Male”, “Other”, or “Prefer not to answers. Our Radio buttons also allow you to use an other text box to find out more information. Another example would be “What is your age?”. Instead of having an open text box that they fill in, you can have a radio button that provides pre-defined ages such as “18″, “19″, “20″, etc. The Star Ranking question allows the respondent to interactively rate criteria based on different categories defined by the row and column headers. Each star represents the equivalent numeric value for that rating (e.g. Four star rating will report a 4). The most common use for a Star Ranking question is to rate products such as books, or movies. However, you can also rate things like customer service and satisfaction. In general, you would want to use the Star Ranking question when you’re trying to put a positive spin on whatever you’re rating. This question type allows you to ask a question about a set of images and then allows the respondent to select and image as their answer. We have both a single select image choice question, and a multi-select image choice question. To learn more about the multi-select question, please see Image Choice (Multiple) Image Choice question types can be used when you’d like someone to pick a specific picture they prefer over another. It can also be an interactive alternative for radio button or checkbox questions. If you’d rather them choose between images as opposed to words, this is the question type for you!